The results from the first study on the eating habits of the people of the Wielbark Culture are now out in a peer-reviewed article: Diet and society in Poland before the state: stable isotope evidence from a Wielbark population (2nd c. AD). They were originally published back in 2012 as part of a thesis, which also included data on the diet of suspected Viking settlers in Medieval Poland (see here). The δ13Cca values from Rogowo [the Wielbark site in question] suggest millet contributed between 0% and 35% to overall diet, depending on the individual. This corroborates archaeobotanical evidence for a broad-spectrum agricultural strategy including millet, barley, rye, oats and wheat (Wasylikowa et al. 1991). Unlike in Eastern and Southern Europe, millet is not widespread in Western Europe. With its occurrence following cultural distribution patterns rather than geography or climate, millet appears to characterize diets of Slavic populations. In her book documenting the history of Polish cuisine, Maria Dembińska posits that “… the Polish preference for millet was cultural and that millet must have arrived with the earliest Slavic migrants” (104). That millet might be used as a proxy for Slavic migrations is an interesting possibility, given the controversy surrounding the relationship between the Wielbark culture and the issue of Slavic ethnogenesis (c.f., Dąbrowski 2006). Millet consumption among Wielbark and early medieval Polish populations represents a potentially significant continuity between the Roman era and the medieval period in Poland. Diet at Rogowo was based on terrestrial foods (meat, milk, and plants), but with supplemental input from fish (likely low- δ15N anadromous or littoral fish), indicating an overall broad-spectrum subsistence economy. Millet was consumed at Rogowo, and in greater amounts than during the medieval period to follow (c.f., Fig. 6; Reitsema et al. 2010; Reitsema 2012). Stable isotope differences between the sexes indicate that men and women may have consumed different foods, although there is a possibility that women migrated to Rogowo from an isotopically different region of Europe. 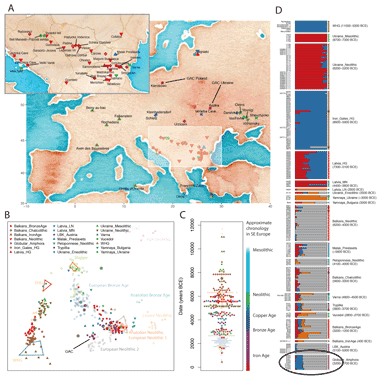 Ancient DNA has already been extracted from some of the Rogowo samples, and the results presented in a thesis focusing on the ethnogenesis of Slavs, and in particular the question of genetic continuity in present-day Poland from the Iron Ago to the early Medieval period (see here). The outcome was somewhat inconclusive, because the study was based on low resolution mtDNA haplotypes. However, the most informative haplotypes showed greatest affinity to those of the present-day Polish population. A more detailed genetic analysis of Wielbark and many other ancient Polish samples, using next-generation sequencing, is on the way (see here). The Vikings who came later didn't take up the local cuisine. So the Wielbark people might not have been from Scandinavia, or even Gothic. Then I suppose this is additional evidence that debunks the classic Gotland>Poland>Black Sea migration of Goths. R1b-U152, R1b-U106, and I2a2 do match Kortlandt's scenario rather well of Goths coming to Ukraine by following the Danube downstream. So if the Goths were actually Bavarians than what was the Ethno-linguistic affiliation of the Wielbark culture exactly? Balts or Slavs? From memory, Kortlandt's theory was that the Goths were a melange of various Germanic groups that gathered along the Roman border on the Danube to raid the eastern provinces of Rome. That seems about right to me. Also, according to Piontek, the Wielbark people were distinct from Germanics in terms of cranial traits, even more so than most West Slavs. But he also showed that they were distinct from Balts in terms of tooth morphology. So my current theory is that the Wielbark people were pre-proto-Slavs who bordered the West Balts, and very similar genetically to most present day Poles and Belorussians. When they moved into what is now Western Ukraine they formed the Chernyakhov Culture. I think this was the Proto-Slavic Culture, which eventually expanded into the Balkans, but also back into Poland. Yes it is a worrying trend. But logically wouldn't you think Goths,Vandals are from Poland could their be a link? I would also think the same can be said for the Hun's + avars, Asian invaders I doubt it they probably came as far west as the Dnieper. If you want to solve the riddle just find a Gothic grave and test it problem solved! Note. The deity Radegast in Czech is most likely Radagaisus the King of the Goths, after he was beheaded they probably sainted him.